In Part 1 I had begun an attempted anecdotal slaying of a personal bugbear- the popular perception, (wilfully propagated by the BBC), that anyone approaching that age loosely called average life expectancy was nearing the end of their natural term. My first two examples were nearly contemporary Englishmen who made their names fighting the Scots (and, on occasion, uppity Englishmen) into old age. My next is somewhat earlier and further afield. Enrico Dandolo was Doge of Venice from 1192 until his death in 1205. For those of you not familiar with the gorgeously unique political system of the Republic this means he was elected as head of government for life by a merchant oligarchy. His great age at his election was widely commented on, but only Marino Sanuto (who is usually reliable as well as entertaining, although far from contemporary) gives an exact figure- of 85 years old at the time of his election. This would have Dandolo born in around 1107. Some historians have tried to shave a decade off this age, but it is generally accepted as probably (if not certainly) true. Equally noteworthy was his blindness, probably caused by a blow to the head and not (despite colourful tales) the deliberate act by the Byzantines. At the time of his election, his sight had started to decline, but it degenerated quickly from then on was soon nearly complete. He came to prominence, even within his family quite late. His father, Vitale, died on a diplomatic mission to Constantinople at past 90 and his uncle, the Patriarch Enrico Dandolo lived to at least his late 80s. His Dogeship however, was perhaps the most pivotal in the history of the Republic. In 1201, with the Forth Crusade needing passage to the Holy Land, Dandolo negotiated to provide this to them, an undertaking which would require the entire logistic resources of the Republic for which he demanded an eye-watering price. When the crusaders couldn’t pay, Venice faced bancruptcy and Dandolo renegotiated much of the payment against future plunder. With the Venetian Republic having a huge stake in the project, the 90 year old, essentially blind Doge joined the fleet. Of course, history tells us that it was Constantinople, not Jerusalem that was sacked by the crusaders, but this is not the place to go into the convoluted, riveting but shameful tale of the fall of the city. Suffice to say that the city was taken, sacked and the rump of its empire divided amongst the victors. Venice got its money back, and many of the great prizes still shown off in the city to this day. That Dandolo was prominent in the councils of war, commanded the naval efforts, negotiated with rival Emperors and elected puppets for the Byzantine throne will be no surprise- none of the youthful Frankish crusaders had his skill or experience, although the energy of a man of his years can only be admired. 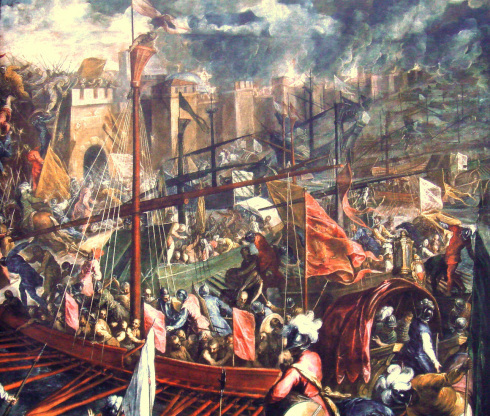 The more astonishing tale was, with the early stages of the assault in doubt, the sightless nonagenarian placed himself in the prow of the lead ship of the Venetian fleet, jumping ashore at the walls and shaming the crusaders into following him. The Fall of Constantinople- No Country for Old Men? He lived, active in Venetian and Byzantine politics to the end, until 1205, if Sanuto is correct, a tantalising year or two short of his hundredth year. I am conscious that again I have focused exclusively on men (and am equally conscious that I am in danger of justifying Early Modern Commons tagging me as a military history blog) and am quite aware of the sin of adding women as paranthesis to the main topic (as well as in the title). However, two of the most famous women of the Tudor era also lived into old age. Elizabeth I, who should need no introduction here, didn’t quite make it to her 70th birthday, but was politically active to nearly the end of her 69 years. 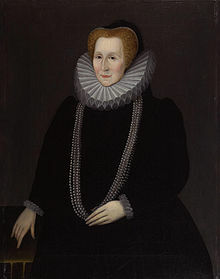 Her contemporary, Bess of Hardwick who was amongst other things, goaler to Mary Queen of Scots, Grandmother and guardian to Arbella Stuart as well as being one of the richest women in England out lived her, dying in 1608 at an impressive 86. These examples are all, to a lesser or greater degree all members of an elite and, of course nothing like representative. In each case, their age was considered exceptional by their contemporaries. Their value as examples is partly their fame- unlike the old man by the ale house fire who has outlived everyone who could dispute his claims of age, or the Old Testament patriarch, their prominence and literacy should have meant that these figures birth’s or early lives were recorded and they did not enter history in old age with dubious claims to venerability. This should give great veracity to their claims of age. Unfortunately, as both Forster and Dandolo have showed, this isn’t necessarily as watertight an argument as I would have liked, but does have some merit. Although I’ve focused on the ruling class in these pieces, due to their notoriety, if you delve into any niche of history, you will find the aged occurring regularly, whether is is the relatively prosperous shipbuilder Phineas Pett (who I’ve talked about at length before) living to a ripe 77 or his contemporaries in the Venetian Arsenale for whom what to do with superannuated shipwrights who seem to have survived in that crowded miasmic city in significant numbers was a recurring problem. There were, in the pre-industrial world, so many things that could kill you as an adult which you might well survive today. Cancers were not curable, heart disease couldn’t be treated with drugs or surgery, lack of hygiene and antibiotics could lead to non fatal wounds, whether in war or accident killing later (although, equally, astonishingly serious wounds were also often survived). War, although not perpetual, could devastate populations (the 30 Years war cut swathes through the Holy Roman Empire) or demographics (it is estimated that in a day at Towton, around 20,000 of the adult male population of England, out of a total population of less than 3 miilion was killed, and at Flodden, the affect on the Scottish adult male population may have been harsh, but the nobility lost perhaps a majority of its fighting age men), and, of course, periodic “malthusian” bouts of plague and famine wiped out large chunks of population. Death by violence outside of war was far beyond modern levels. Childbirth, although perhaps not quite as dangerous as the popular imagination would suggest (it is estimated that 1.5%- 2.5% of women died per birth in the 17th Century, compounded at a time where multiple pregnancies would be common), was not anything like the coin toss for survival which is sometimes suggested but awful by modern standards and enough to make a dent in life expectancy statistics. But whilst there were plenty of things to kill you, if you managed to avoid them all, you aged pretty much as we do now. We carry the same genetic make-up as our ancestors. A 30 year old woman was not middle-aged, she was probably just married, at the peak of her strength and near the prime of childbearing. Menopause occurred at the same age as now, and women bore children until it occurred. An active man of my age, if luck had avoided illness or injury, would now be in the same relative physical state as I am- considerably less spry than in his youth but with most of his strength intact and not yet at the edge of dottage. Life expectancy at birth has its uses as a single, compound statistic for a society’s health (albeit one muddied by violent and accidental deaths). But its value is only ever relative between different societies or societies over time. It can tell us in broad terms that you were more likely to live long and less likely to die young in modern Britain than Late Victorian Britain, and Late Victorian Britain than Seventeenth Century Britain. It can tell us the same when comparing modern Western Europe with sub-Saharan Africa. Its anomalies can be instructive, but only in comparison, so the shocking decline in life expectancy Zimbabwe in recent years or the markedly low figure in Glasgow only have value when compared to the figure attained in the recent past, or in neighbouring cities. What it is not is a useful measure of how long a woman of a certain age could expect to live and certainly not a measure of where in the process of aging a man of a certain age stands. Indeed I am struck when reading about deaths in the Early Modern Period (as demonstrated quite neatly in my brief study of the Pett Women) is not that people died of premature old age in their 50’s, more that there was almost no decade of your life when there was not a good possibility of death occurring. Mortality may have been somewhat lower amongst strong adults in their prime, but it it was still ever present. We have seen that men led active professional, political and military lives into middle age. Women (such as the Petts) bore children into their 40’s and rules households or even counties into old age. Caxton, embarking on his new career at around 40, would have known that he probably had nearly as much chance of reaching 50 as he had of reaching 40 a decade earlier i.e. probably but far from certainly. What contemporary thoughts were with regards their expectations of a lifespan is another matter, and a fascinating one, although it is a thesis I will have to leave to others. I suspect he would have known that mortality was ever present, but hoped to live a long life and planned his endeavours in the anticipation of being able to complete them. Bragg’s suggestion that men in early middle age used to curtail any ambition and merely wait to die seems to me not only against human nature, but can be dismissed with the most superficial investigation. For the record, he lived to be past 70.